Posted June 21, 2015 by Josh Jordan & filed under General. After nearly a year away, I’m back blogging! Let’s just hope this doesn’t turn into an annual thing! So I got tagged by Hannah in her Eleven Things post and I figured this would be my chance back into blogging, so here goes! 1) Are you a PC or an Apple Mac person? 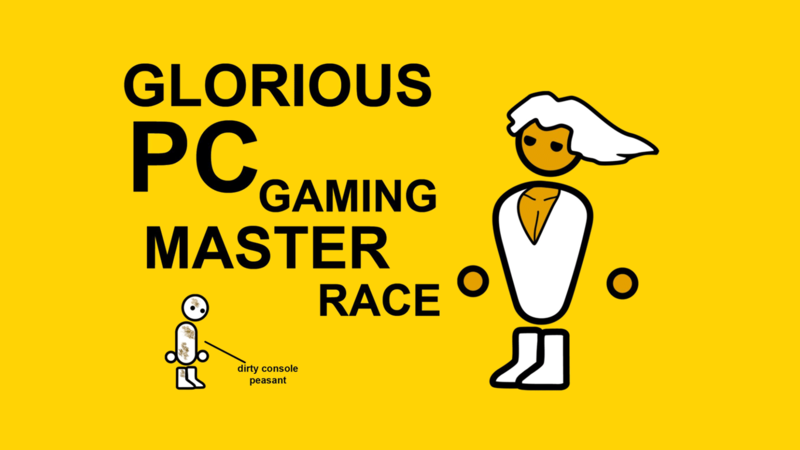 PC Master Race! Ha! No but in all seriousness the PC does everything I need it to; all my games run on PC, all the programs that I use to code run on PC and you never had any trouble upgrading the hardware. I don’t mind Mac’s if I’m honest, I might play up the PC Master race thing a bit but if they work for you then go with it! Just as long as you don’t fall into the trap of thinking they’re better because they cost more! Don’t even get me started on that one! 2) What do you enjoy most about being a blogger? Helping others learn. If I have undertaken a new challenge or task recently and I’ve had to overcome some sort of challenges during the process, I like to blog about them so that my learning experience might be helpful to someone else. Helping myself learn. There is no better way to help solidify what you know in your brain by going over it again and blogging certainly helps with that. Another aspect is that for me writing is hard, I’ve always struggled with it and unless I write often, I’m never going to get better right? I tend to type how I talk and I’m told that isn’t good. One tip I have for this is, once you’ve finished writing, pump your blog through a text-to-speech converter and hear a computer talk it out loud, that often points mannerisms. 3) What cancelled/ended TV show do you miss the most? If I said I was a fan of Science Fiction, half of the 4 people reading this will probably guess what I am going to say; Firefly. I’m not going to say anything more on Firefly because I think you should just stop reading this post and go and watch it, you don’t have to be a Science Fiction fan to love it, it’s one of those shows that everyone enjoys (don’t be the first person to hate it!!!). 4) If you could be an animal for a day, what would it be and why? I’ve always thought if I were an animal I’d be a wolf, but given the opportunity to be something different for the day, I’d choose to be a Raven. I love the idea of flying through the skies with the find in my feathers, seeing the world from above, covering great distances quickly and of course messing with superstitious people. 5) Are you any good at cooking? If so, what’s your favourite thing to make? I love cooking but I probably wouldn’t go as far as calling myself “good”. I’ve lived away from home for about five years now and I’ve not poisoned myself…yet, however I am not very adventurous with my cooking. I sort of have a set of meals that I always seem to cook and I rarely deviate from them, not that I don’t want to deviate, more of that I can’t be bothered when it’s just me! 6) Do you have a favourite blogger? If so, why do you like them? Hannah at http://www.missnicklin.co.uk/ – Hannah’s blog is a great place to find out about stuff in and around Cardiff. She writes really good reviews on the events she attends and the places she goes, great for finding out about stuff you’ve missed out on! I also really recommend following Hannah’s recipe for Sweet Potato chips! Ray at http://toysaturn.blogspot.co.uk/ – “Josh why are you reading a fashion blog?” is probably what you’re thinking now, but Ray’s blog is a lot more than just fashion. She blogs about places she goes, things she does and people she meets. Her series of posts on Disneyland are particular great reads! 7) What do you find least enjoyable or hard when it comes to blogging, or what have been your biggest challenges so far? Actually making myself write something. I’ve done tons of projects since my last post (nearly a year ago) but I’ve never actually got around to writing them. It’s laziness really on my behalf and I have no excuse. 8) Do you prefer online shopping or actually going into shops? 90% of all the stuff I buy is online these days. I love hunting around online for bargains and discount codes. I also don’t own a car anymore so if I’ve ordered something large having it brought to my front door makes it so much easier than lugging it through town. 9) Can you speak any other languages? Ich spreche kleine deutsch! – I used to be able to hold full conversations in German after GCSE’s but since then I’ve never had a reason to keep using it and I’ve forgotten most of it. One day I’ll start learning it again! 10) What is the best thing about where you live? Right now the leftover Chinese food in the fridge is pretty good! In all seriousness though, I do love living in Cardiff city centre. I grew up in a village miles away from anything so it’s great to be in walking distance to shops, cinemas, entertainment venues and even work. 11) Are you where you thought you’d be in 5 years, 5 years ago? Five years ago I was just about to go to university and start my computer science degree and my only goal back then was to pass. I managed to bag myself a 2:1 and use that to get a job the NHS where I worked as a Software Developer on the integration and referencing team (it’s a lot more fun than it sounds, honest!). As of June 2015 I have been offered the post of Senior Developer on the Welsh Demographics team, which I am very much looking forwards to starting! However, this is the NHS so I’ll be lucky to start that job before Christmas at this rate! And that is that! I can’t believe I managed to write over 1000 words and not use on tongue emoji! I would tag some people and ask some more questions but I think it would go unanswered! So feel free to answer the same questions I did if you like, they’re rather fun. Yay! I’m so thrilled that you did this blog! Woo! It’s really cool finding out more interesting things about you! I’m sorry to say this but…I’ve never watched Firefly! 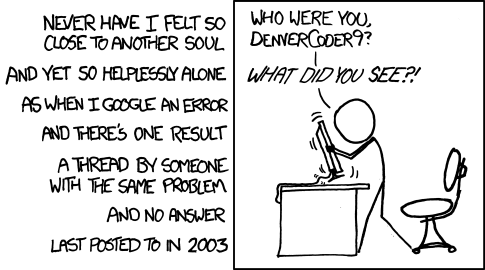 I feel like I should now though… How does one find it? Netflix? Sky?? Awww thank you so much for mentioning me in your favourite bloggers answer (what do I owe you??!) haha 😀 I’m going to give Ray’s blog a read later on, I love finding new bloggers that my friends recommend! I feel the same when it comes to blogging, it can be quite daunting and hard work writing a blog so sometimes I put them off for ages. But I wouldn’t say you’re lazy 🙂 – You did this blog super quick!! I agree with you about the online shopping thing, it does give you the opportunity to search round for the best deals, whereas in shops you have a much smaller selection. That German was pretty impressive! I’m amazed you can remember that since GCSE’s, I can hardly even remember basic multiplication from GCSE’s! haha. Thanks for the comment! I believe you hold the record for longest comment ever on this blog – I didn’t take one for me to use one! I think Firefly is on Netflix these days, if’s not then I have the box set kicking around somewhere, you’re welcome to borrow it! I’ll try and make sure my next blog post doesn’t take nearly a year!